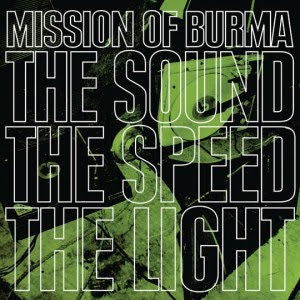 Now on their third studio album since the close of their long hiatus, Mission of Burma have aged scarily well, and with The Sound the Speed the Light they are, in their early 50s, as perfectly sloppy and punk rock as they were in the 1980s. “1, 2, 3, Partyy!” [sic] is among the group’s best “pop” songs, excessively listenable, Roger Miller’s guitar skipping all over the place. “One Day We Will Live There,” choppy with testosterone, would actually work quite well on 2006’s The Obliterati, and “Forget Yourself” and “Comes Undone” remind quite a bit, in their noodling guitar and dramatic buildup, of …Trail of Dead’s Source Tags and Codes (though the order of any coincidental similarity or influence should be apparent). Vocals, taken from each member, are alternately playful and booming, with a confidence that only occurs with age, indicating that there was actually some enjoyment in recording. Whereas the fantastic but top-heavy The Obliterati found Peter Prescott’s drumming a new (albeit welcome) focal point, The Sound is heavy on guitar, more consistent, and much closer to some of the band’s best work from its early career.